This isn't really our next stop but I'm toying with the idea of a trip to Rio. It's a long flight but without jet lag, it has its appeal. My husband has always wanted to see the Christ the Redeemer statue and it does seem like a vibrant place to visit. I've heard mixed things on the crime issues there. Some say that if I stay street smart and stick to the tourist areas, I'll be fine. Some paint a darker picture. Not sure what to believe but it certainly looks stunning. Anyone been to Rio and want to chime in? What is a must do/see? Extra points for toddler friendly activities. My husband and I honeymooned in Rio back in 2007. Every single person that we talked to made it seem that we were going to be mugged instantaneously the second we stepped outside. We weren't. We stayed right on the Copacabana beach and even walked all the way over to the Botanical Gardens from our hotel in the middle of the day. Sure, when it came time to leave in the early evening we took a taxi back to our hotel. But during the day we felt safe walking around (although I thinking have a 6'1" husband might have helped with that!) and we took taxis everywhere at night. I will say, we typically eat dinner around 7 and we had entire restaurants to ourselves because most Brazilians don't eat dinner until much later. That was pretty standard in Rio. We did a mix of guided tours for the big attractions and then days on our own. I didn't carry a fancy designer purse and I kept my camera in my purse whenever we were walking around. One of the absolute highlights of our trip was going to a soccer game at the Maracana stadium. Thanks Heidi. We will have a child with us so it would definitely be early dinners and tourist areas for us too. I am a Brazilian native, Brooklyn resident. There are HUGE issues with Rio right now and I would not recommend going to Rio de Janeiro (the city). However, Rio de Janeiro (the state) is equally beautiful and much safer. PM me at pinkbrownstone at gmail and I can give you more info. I was in Brazil for World Cup last summer and it is a beautiful country. We really enjoyed our stay in Curitiba, I felt very safe there and it is a great place for families, but no beaches. If you are looking for beaches, then I would probably avoid Rio and go for Fortaleza or Recife instead. My husband is a Rio native and we've been several times. Safety is a big concern - I don't bring my wedding ring, designer sunglasses/bags, and I keep my cell phone to a minimum. That said, it's absolutely stunning and I really believe it's a place not to be missed!! The geography is exceptional. Christ the Redeemer lives up to its hype. (and you can a tram thru a gorgeous rainforest to get there). Copacabana, Ipanema etc. are beautiful (and the people watching!!). If you have time, Buzios is a beach community about 2.5 hrs drive from Rio that is SAFE, GORGEOUS, has all the feel/culture of Rio but markedly safer. It's a popular spot for European visitors too. (Bridget Bardot put it on the map in the 60's). A quick google search will give you more info. It's called "the playground of Brazilian elite". It might be good to do the Rio city sites and then spend a few days in Buzios. But seeing as you guys are such seasoned travelers, I don't think you'd feel more unsafe in Rio than other major cities you've gone to. Just be alert, err on the side of caution, and avoid bad neighborhoods (and red lights at night - carjacking is a notorious issue). Having worked in GIG(Rio Airport Code) it is a beautiful place but not a place to take a toddler. It does have a lot of crime and you have to be VERY careful. Recife may be a better place for you on the coast north of Rio. Not sure what you are looking to do but there are many places in the Carribean and Central America that are very nice. Costa Rica- Marriot's Los Suenos is a beautiful resort and then you can go up to the mountains and stay in a beautiful resort up there. Belize is great for diving. Cuaraco is a beautiful spice island. I'm not a big fan of Brasil and you may be able to have a better trip closer to home. A couple of years ago my husband and I decided to check a visit to Rio off of our travel list. I was very nervous about the crime and had heard about quick-knapping from Trip Advisor (apparently one is kidnapped and held at gunpoint while forced to pull money from multiple ATMs until released after the balance is fully drawn for the day). Despite all this we decided to go and ensured our hotel was in the main tourist areas of Copacabana. I will say that from the start I felt completely safe there. While I definitely wouldn't recommend traveling outside of populated areas (especially at night) in fear of wandering into the favelas, we had no issues at all. Many tourists wandered around with their valuables, cameras and purses openly displayed while on foot. We walked in the dark from restaurants and back to our hotel and did not feel threatened. 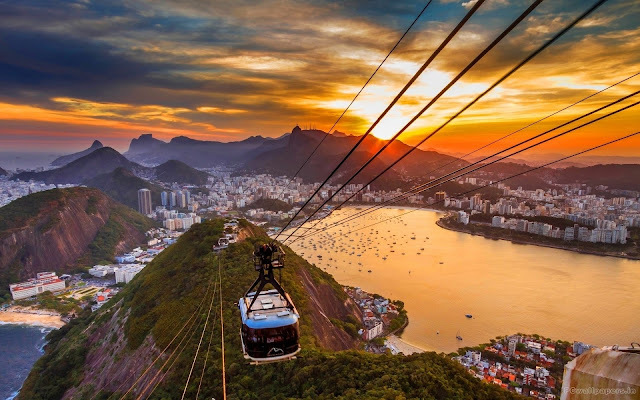 To see Christ the Redeemer and Sugar Loaf, we simply hired a well reviewed driver and didn't rely on public transportation just to be on the safe side. He was great and also served as a tour guide in many ways. Rio was easily a top destination spot for us and I would go again in a heartbeat. You're a smart traveler--just do your research and trust your judgement. It'll be great. The beaches are breath taking. Crime is bad just never wear expensive things leave wedding rings at home. When out only take what you need on your outing. Ask the hotel for a safe. Someone in my group did have an attempted robbery but it failed. It was also at night on the beach. It is well worth going just don't flash I am American with name brands.